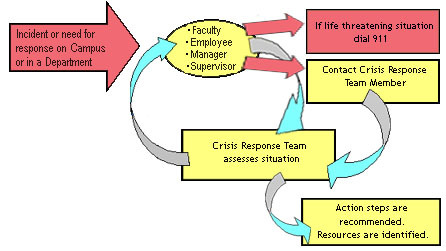 In case of non-emergency workplace intimidation, threat or act of violence, please contact any crisis response team member below. The University of California at Davis can best perform its missions of teaching, research and public service when faculty, students and staff co-exist in a climate that supports the free exchange of ideas and utilizes constructive methods of conflict resolution. Intimidation: an act towards another person, the purpose of which is to coerce, and the result of which could reasonably cause the other person to fear for his or her safety or the safety of others. Threat of violence: a communicated intent to inflict physical or other harm on any person or property. Act of violence: exercise of physical force against another person or property. Bullying: offensive or malicious behavior through persistent actions typically meant to undermine, intimidate, or demean the recipient. Any and all acts of intimidation, threats or acts of violence will be considered serious misconduct and will be the basis of disciplinary action, up to and including dismissal. These acts will be referred, when appropriate, to legal authorities. Assurance of a safe working environment is important to everyone. It is the responsibility of all members of our community to report any occurrence of intimidation, threat or violence to the appropriate campus resource.